When homeschool moms get together, what do we talk about? It never fails that the conversation strays to homeschooling. We talk about homeschool styles, curriculum, our schedules, what our kids are learning, and our homeschool challenges. Sometimes I come away from those conversations encouraged. However, I most often walk away feeling defeated and discouraged. Why? Because throughout the conversation I’m comparing myself to the other homeschool moms and I’m always feeling like I come up short. I worry I’m not doing enough in my homeschool. Or my kids are behind in their learning. I think my homeschool isn’t as rigorous, or as fun, or as creative, or as organized. And to overcome my fears and insecurities, I sit back and judge the other homeschool moms. Of course, I don’t usually say much aloud, but silently in my head I’m comparing their homeschool to mine, and I’m looking for ways that they come up short. It’s not fun to admit the truth that other homeschool moms are judging you and you’re probably judging them as well. So lately I’ve tried to change the topic and talk about something else. Can’t we talk about some other part of your life or of mine? Do you even have a hobby outside of homeschooling? For the longest time I really didn’t. My life was consumed with homeschooling and with curriculum options. But then I began to feel less like myself. I felt defeated and lonely and very burned out on the homeschool journey. So I made a huge change. I started making time for myself. I set an end time to our homeschool day. Once our school time has ended I let my kids have free play time. The one rule during this time is that they cannot interrupt my quiet time. I workout; I read; I blog; I even take long showers. Sometimes I steal downstairs to my piano and play some of my favorite songs. I’ve started making time to check in on my friends – I call, text, email, or message them. I’m feeling more connected, and I get to enjoy some adult conversations. I’ve rediscovered myself again. I may not be quite as much fun as I used to. Let’s be honest – falling in to bed exhausted at 9:30 definitely puts me in the “moms of small children who have no real life” category. But that’s ok. My idea of fun is a little different now. I’m content to carve out a few hours here and there to enjoy a few simple things. When we get together, don’t tell me about your homeschool day. Sometimes I’d like to be just two adults getting the chance to catch up. Let’s start by talking about us. Let’s get to know the person behind the homeschool curriculum and the homeschool teaching style. Because sometimes when we start talking about this homeschool thing, we start to feel inadequate and judged. We feel the need to compare and to even brag. All of our insecurities seem to rise to the surface. Can we find some new and different conversations? Lately, I’ve discovered new interests and rekindled old hobbies. I hope you have too. We can share what we’re learning about ourselves. Of course, I’m sure the conversation will inevitably stray to homeschooling at some point – it’s just who we are as homeschool moms. But first, can we be just two women enjoying an adult conversation? I’m more than just a homeschool mom. 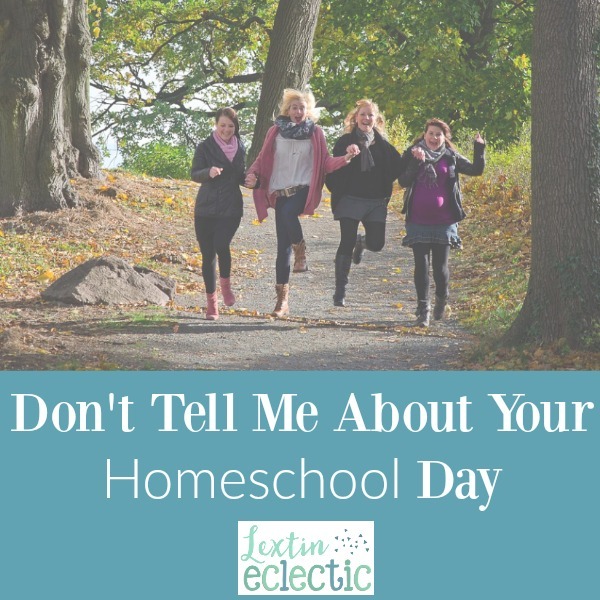 Don’t tell me about your homeschool day. It’s so true about motherhood in general. Sometimes we forget how to make connections about us, not our children or mommy selves. Thank you for always sharing your heart! Every post I read of yours I can so relate and I am so appreciative of you sharing! Thank you! One of the most encouraging “homeschool moms” conversations I had was from a mom who’d homeschooled linger than myself and seen a lot of other homeschool kids through the years and she told me “It all evens out in the end.” Kids that were advanced kindergartners, and kids that couldnt read till they were 8… they all balanced out and made it through. That’s such great advice and it’s so true!